It took us three hours and 15 minutes to get to the mooring field in Spanish Wells. On the way we passed the famous Glass Window Bridge. It was a short dinghy ride from our anchorage in Gaulding Cay, but we didn’t get around to going there. The Glass Window is a very narrow passage between the aquamarine Caribbean Sea and the dark Atlantic Ocean. It’s supposed to be quite dramatic, but I guess we’ll visit it next time. We were able to get mooring ball 8 in the Spanish Wells mooring field, the same one we had three years ago. 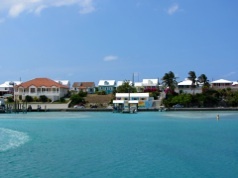 In the photo, you can see that the mooring field is very close to the town, making for a very short dinghy ride. I think there are only eight balls and they cost $20 a night. Our plan was to stay here for a week. However, Friday morning that plan changed. We listened to Chris Parker’s 6:30 am weather forecast and learned that squalls are predicted for Florida beginning Monday. If we could get back in the early afternoon we might avoid them. If not, we wanted to at least get to Bimini so as soon as a weather window opens we could get to Florida in one day. We are disappointed that we can’t spend more time in Spanish Wells, but with two weeks left before June 1, when we have to be at a dock in Stuart to satisfy our insurance policy, we have to take the weather window now. Friday morning we went to Batelco to get more data on the iPad and then went to the Food Fair grocery store. This is the best grocery store we’ve been to in the Bahamas other than the Fresh Market in Nassau. We thought we had lost some of Daisy’s amoxicillin pills so we stopped at the pharmacy in the grocery store. We needed one more week’s worth and realized the health clinic only gave us one week, not two week’s. We paid $35 for what turned out to be one week’s worth at the health clinic in Rock Sound. We explained our dilemma to the pharmacist and he took the empty envelope the nurse in Rock Sound had written on and gave us seven more days of pills for Daisy. When he handed me the envelope, I asked him how much we owed. He said, “nothing.” I couldn’t believe it and can only figure he has a dog or loves dogs. Or maybe he just felt sorry for people who didn’t count the pills before they left the clinic. 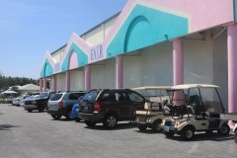 This is one of many examples of how cruisers are treated by Bahamians. It will be a bit of a shock to get back to Florida where everyone doesn’t smile and say “hi” and where everyone doesn’t go out of their way to be helpful. Many cruisers hitchhike in The Bahamas to get places where they can’t walk and are almost always picked up. It’s a very safe thing and well accepted here. 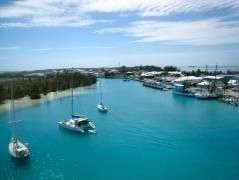 Looking over our options for returning to Florida, we decided to skip Nassau and head to Chubb Cay the first day.. In order to do that we left the mooring field and motored about an hour north to Royal Island where there is a large anchorage. 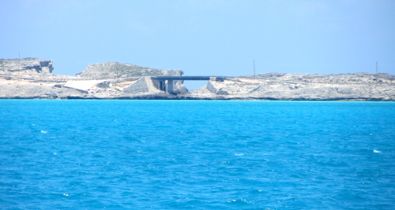 Cruisers use this location to jump off north to Abaco or east to Nassau on their way back to The States. Our second day will take us to Bimini so we called Bimini Sands Marina to get reservations for the week, hoping that Memorial Day weekend would have better weather for traveling. If the weather is still good on Monday, we’ll leave very early to sail to Lake Worth, FL.